There aren't many apps where the name is also a sentence, but Google My Business tells you precisely what users want their customers to do. The app gives you control over some of the information that appears when people go searching for your fine establishment, and the latest release impacts the interface that appears when you go about updating that information. Google's new editor borrows from Search and Maps, where details pop up on a card from the bottom of the screen. You now have the ability to not just designate specific hours of operation, but to show if you're open 24 hours. A new option then lets you view the final result for yourself on Search, Maps, and Google+. You can give your customers a more thorough look at your service area by sorting through city, postal code, or radius. If you have a Google+, you can now view insights of who your posts are reaching. Here's the changelog. You'll find the download link underneath. Update your info in a reimagined editor inspired by Google Search and Maps. It’s simpler, quicker, and a whole lot prettier. (And now supports businesses open 24hrs). 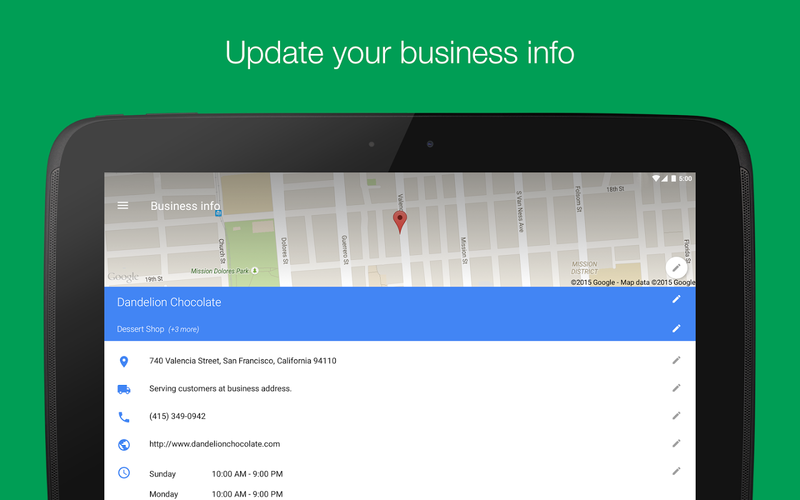 View your business on Search, Maps and Google+ with a single tap. Like magic, but better.